THE EDITOR: The manuscript was published more or less as submitted. THE PUBLISHER: Publishing Genius Press. SUMMARY: It’s a collection of poems, mostly prose poetry. There’s not really a plot per se, though they’re all vaguely surreal. Little bite-sized chunks of weirdness. A lot of them heavily feature the moon. THE BACK STORY: I had been doing a thing for a while where I would post little poems as images on Tumblr. They worked well in that context. Something about the text being formatted into neat little cubes was pleasing to the eye, or at least seemed that way to me. It was fun to me. I kept going with it. 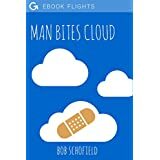 Eventually I had so many they filled an entire book, and Publishing Genius was starting a new imprint called Ebook Flights, in which three small books would be bundled together. Mine was part of the first set, in great company alongside Lily Hoang’s Invisible Women and Gabe Durham’s Locked Away. WHY THIS TITLE? : It’s what poetry feels like to me, or writing in general, really. When it’s going well it feels like I’m tearing into something intangible. Something very wispy, and high above me. WHY WOULD SOMEONE WANT TO READ IT? : If they have an open mind I think they’ll have fun with it. It’s not a big commitment. You can just pick it up and go. In fact you don’t even need to pick it up, since it’s an ebook. The world inside the book is strange, but at the same time I believe it goes down light and smooth. REVIEW COMMENTS: “Delightfully weird, a collection of slightly connected flash pieces and poetry that use seemingly random images and emotions to create a satisfying, experimental collection,” James Yates, The Collagist. “Amusing, cranky, and weird,” Goodreads user, Brooks. “Think of it as a literary version of a wine or beer flight, enough to get you started, enough to get you thirsty for more,” Adam Robinson. AUTHOR PROFILE: I’m the author and illustrator of The Inevitable June and Moon Facts. I write words. I draw pictures. I recently got on a plane and flew across an ocean and moved to a city I’ve never been to. I’m learning my way around. I’m going back to school. I like change, but also quiet. I like to close my eyes and imagine a bunch of things that aren’t really happening. Then I like to write them down. I like technology and all that it has done for us. But I also enjoy a very green tree with lots of small things way up in it. I believe few things are as sacred as the combination of morning and hot coffee. I’m pretty sure I’m not getting nearly enough sleep. AUTHOR COMMENTS: I wanted to make something fun and light and weird. I want people to smile when they read it, and maybe go, “huh?” And maybe their whole world gets just 0.001% stranger. I took a family of wolves into the palm of my hand. I hurled them at the moon. They stuck there. One thousand furry darts. Their dumb fangs so pointy and stubborn. So absolutely white. Unable to do anything but shine brilliantly in their useless wolf mouths. I laughed long and deep into the warmth of my tea. The winter is such a great time of year, I thought. So much for us to do while we wait patiently to change sweaters. LOCAL OUTLETS: It’s an ebook.